Welcome to 1958, where the idyllic little town of Harmony Falls is--in the words of Ray Palmer--comprised of "an immortal psychopath and racists." Ah, yes, the perks of time traveling to the past means interracial marriage, non-heterosexual preferences, and darker shades of skin color are big "no-nos." But this doesn't stop the Legends from trying to stop Savage or trying to make the world a better place, one person at a time. Jax: "Dude, even if this town wasn't full of small-minded idiots, it'd still be creepy as hell. I used to watch all these old horror movies with my mom, and they all started off in places like this. See, first, it's all perfect, and then boom, some alien monster beast thing starts killing kids on Lovers' Lane." Immediately, I got the biggest Grease vibe between the dangerous car race and the seemingly naive blond cheerleader with the greaser boys. However, surprisingly, nobody referenced this. Nope. All the pop culture references were wonderfully taken from another 1950s time-travel series: Back to the Future. Under the Sea dance? Jax calling a bully "Biff"? I love it. I just love this show. Anyways, this episode was very interesting. And not because there were creepy hawk monsters flying around or because Savage can make a good casserole. Nope, it was interesting because of the 1950s culture and dynamics. I'm so glad this show didn't cower behind fear of offending someone. I'm glad they openly keep historical culture in to show that the Legends are above the past. People treated Kendra and Jax terribly because of their skin color; Sara had to, in her words, liberate Nurse Carlisle from her fear of judgement for being homosexual; and Ray and Kendra had to work out their "fake" marriage due to the uncommon and frowned upon opinion of interracial marriage. Remember when I said this show was groundbreaking not only for redefining what it means to be a hero but what it means to be a TV show in the 21st century? 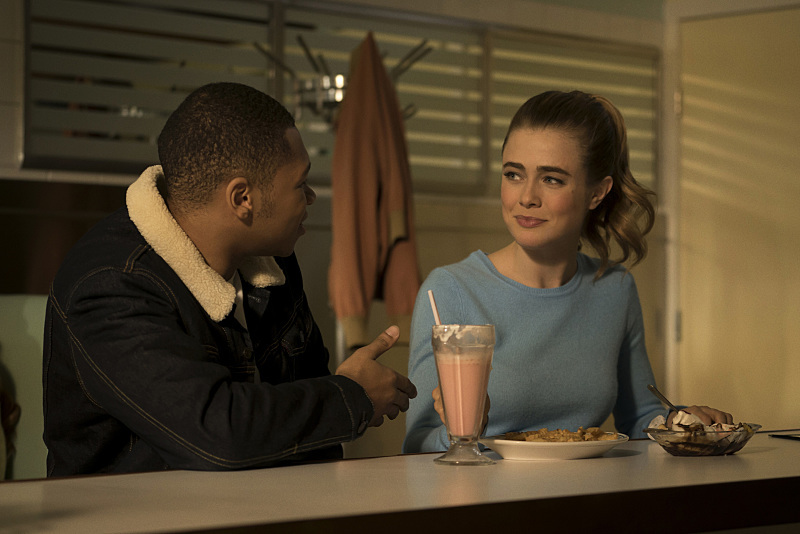 Yes, Legends of Tomorrow continues to offer much-needed diversity across the spectrum. Moving along, the whole meteorite thing was... odd. Even for me. (What is this, Smallville?) I mean you're telling me Kendra and Carter got their hawk powers from a meteor? And by injecting samples of the meteor into someone, Vandal can create Hawk monsters? What? How? Who? I don't know. It was odd. And creepy. Super creepy. Stein: "She's talking about an Nth Metal meteorite." Snart: "Say something that makes sense." Stein: "It seems Mr. Fuller has come into contact with a meteorite with mutagenic properties." Once more, every member of the team is paired off with another to complete their end of the mission. While we've seen Ray and Kendra paired up multiple times before (they're really trying to sell their relationship; I'm still on the fence), the other pair-ups were definitely interesting--and hilarious--dynamics. Snart: "So Raymond and Kendra are shacking up, Sara is Nurse Ratched, and Jax is the new kid in town. Where does that leave me?" Seeing Kendra and Ray play house was adorable. Ray is a giant puppy dog cupcake. He dances with Kendra in their new "home," he defends her (twice) when someone thinks she's a maid, and he worries over her when she confronts Savage alone. (Which was actually a horrible decision, really.) But he also learns that Kendra can and will handle herself. He learns to give her room to be her own person, which is actually adorable. So now there are two adorable cupcakes on the Wave Rider. Stein and Sara paired up was a marvelous time, especially since Sara isn't afraid to speak her mind. She defends Nurse Carlisle from a creepy dude hitting on her, and she encourages her about her predicament. I think Sara Lance, the so-called reborn assassin, deserves so much credit for her character development. She can be just as caring and compassionate as her sister, Laurel, and still retain her awesome "ninja" fighting. Plus, Sara discussing her feelings with Stein was perfect. I feel like Stein doesn't get enough credit because he's old, grumpy, and a know-it-all. But more often than not, he's the one with the best advice and a workable plan of action. Jax on his own investigating the missing greasers was great too. I liked how smooth he was talking to the blond cheerleader, Beatty; he didn't let the opinions of the other people in the diner keep him from completing the mission. Plus, he showed Beatty that his skin color didn't matter: he was a nice guy, who wanted to genuinely get to know her and help her out. Plus, he was super funny and adorable and he stood up for her against the "Biff" bullies. Good job, Jax. I liked that, for once, he could succeed at his mission. However, I was not expecting Savage to turn him into a Hawk monster. That was creepy. But I'm glad they saved him in the end. What a wild ride Jax had this episode. "Special Agent Rip Hunter. This is my partner Leonard." Okay, so I absolutely loved Rip and Snart's team-up. Not only was it interesting to see these two team-up, but their clothes were fabulous. (Apparently the only good thing about the 50s, eh?) Plus, the whole good cop/bad cop routine was just perfect. I will never be over Leonard Snart and his sass. He delivers perfect lines every time. I like that they aren't ignoring the end of last week's episode. I think the Rory ordeal will affect Snart for a while; I'm still not convinced he's dead though. (No body, no proof--they just said Snart makes people disappear, not die.) It's great to see Snart get recognition for his heroics, even if he probably doesn't believe he's a hero. But he is; he saved Jax. This episode consisted of a lot of fighting and a lot of kissing. Jeesh. A lot. While the meteor thing felt overplayed--only because it literally was every episode of Smallville for ten years--and a bit unbelievable (if someone has a good explanation of why a meteor from outer space turns humans into birds from Earth, please let me know), the episode was still exciting. I kind of hoped the Legends would learn, for once, how clever Savage is. It's not like he survived the last couple thousand years by being an idiot. Of course, he knew. He's Savage. Plus, they need to learn to work more as a team and to provide back-up for each other. Come on. When is back-up ever a bad idea? N E V E R.
However, this had a lot of great moments and a lot of twists. I didn't expect Jax to get turned into a monster--I didn't even expect the monsters to be former humans at all. (I just let that one slip right by me.) Of course, Boba Fett returned just in time to mess everything up, but I'm just as shocked that the Wave Rider took off without Ray, Kendra, or Sara. What will they do? Who's in control of the Wave Rider? I guess we'll have to find out on the next episode. To the DeLorean... oh, wait. What did you think of "Night of the Hawk"? React with me in the comments!